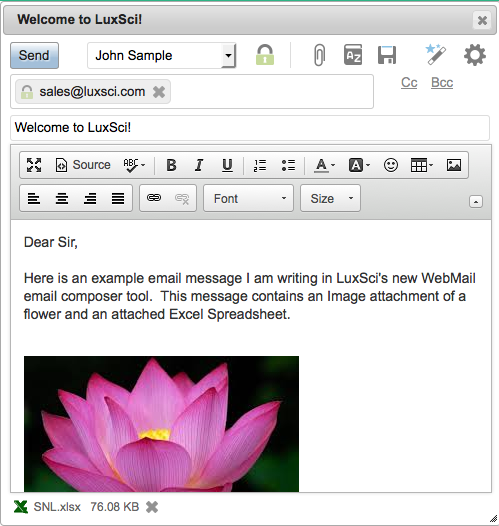 To learn about the new WebMail Composer and our ongoing plans for enhancing the LuxSci web interface, see The Beginning of the New Luxsci Interface. In this document, we answer common questions about the new composer; in particular, shedding light on things that are different to help acquaint you with the changes. What does Composer look like? Open Composer in a separate window? be inconsistent. The new composer opens inside your current window by default as an internal window. If you would like to get back to opening in a separate window, we have a preference for that. Open the composer, click on the “Magic Wand” icon at the top and choose “Composition Settings”. In the “General Preferences” area, change “Where do you like to compose email messages?” to “In a separate (pop-up) window” and press “Save Changes”. Enable or disable email encryption or change email encryption options? You can attach files by dragging and dropping them from your computer into the composer window. If you are using the HTML editing mode (as opposed to plain text), be sure that the composer changes to save “Drop files here” when you drag over it. It won’t if you try to drop into the HTML body of the message (though if you are dropping an image, that may embed the image directly into the HTML). Dropping over the message header area (where you have the Recipients, Subject, etc.) will avoid this.If you are using an old web browser (E.g. Internet explorer 8 or 9) that does not support file drag and drop into the browser, then you can attach a file by clicking on the “paperclip” icon at the top of the composer window. We also recommend upgrading your web browser to Internet Explorer v10+ or changing to something like FireFox, Chrome, or Safari. Attachments can be selected from your WebAide Documents by using the Magic Wand and choosing “Add Attachments – From Documents WebAides”. Click on the “X” icon next to the attachment name at the bottom of the composer to remove it. Preview the attachments or see the full attachment file names? You could not do this in the old composer! In the new composer, you can click on the attachment name at the bottom of the composer window to open that attachment in a new window so that you can preview what it looks like. You can also mouse over the attachment name to view the full name (long names are truncated in the user interface to save space; the full file name is shown in a tool tip). Add Cc or Bcc recipients? Click on the “X” icon next to the recipient to remove it from the message. Also, if you press the “backspace” (or delete, depending on your computer) key while at the beginning of the To, Cc, or Bcc input fields, that will delete the last recipient added to that field. See more details about each recipient? Use your mouse to hover over a recipient. The tool tip will show you things such as the recipient’s name, full email address, and SecureLine encryption details (See below). What is actually shown depends on the context, the particular recipient, the information available, and your preferences. Search my address book for contacts? Click on the “Address Book” icon at the top of the composer (or click on the “Magic Wand” and choose “Search for Recipients”. Additionally, the auto-complete feature that gives suggestions as you type addresses into the Recipients (To), Cc, and Bcc areas has been enhanced and is much more useful. Save a message as a Draft? Click on the “disk” icon at the top of the composer (or click on the “Magic Wand” and choose “Save as Draft”). The new email compose also auto-saved drafts just like the old one did (if that email composition preference is enabled … see your “Magic Wand – Composition Settings” page to check). Change the “importance” of a message? Switch between Plain text, HTML, and Advanced HTML email composition Modes? Click on the “gear” icon to change the “Composer” type. Change the message sending options, like “save a copy in sent email”? “Requesting a Read Receipt” and “Saving a Copy in Sent Email” can be toggled in the menu that the “gear” icon brings up. Click on “Magic Wand” and choose “Templates” to bring up the usual options for selecting and managing your email templates. The interface for SecureLine Email Encryption in the new composer is designed to hide the information you don’t need to see until you ask for it. It seeks to be minimally intrusive while providing all of the functionality that you are used to seeing. This applies only to users with a SecureLine license. Click on the lock icon at the top of the composer to turn encryption on and off. Hover over the icon an a tool tip will tell you the current state of encryption. If the lock is green and closed , then encryption is enabled. If it is yellow and open , then encryption is disabled.If clicking on that encryption icon “does nothing” (e.g. you can’t turn encryption off), then your account’s security settings do not currently permit you to opt out of email encryption. See your account administration for assistance. How do I know if each recipient is “all set” for encryption? SecureLine determines how each recipient will be encrypted to “on the fly” based on who the recipient is, what their mail servers support, your account and user settings, and your address books. When you enter a recipient and are done (e.g. by pressing enter, a comma, or by leaving the input field to click somewhere else), the recipient gets displayed in a “bubble”.When SecureLine is deciding what to do with that recipient, a spinner is shown to the recipient’s left. If SecureLine is “all set” and can encrypt for the recipient, a green closed lock is shown next to the recipient. If more information is needed (e.g. a SecureLine Question and Answer), then a red line is drawn around the recipient’s bubble and a warning sign is shown next to the recipient.if you hover your mouse over the recipient, a tool tip will show you the details of what kind of encryption will be used and/or what is needed still. If you are using questions and answers to authenticate for your SecureLine Escrow recipients, then you can click on the recipient bubble to view / edit the question, answer, and the time after which the Escrow message will expire from access. Enter the new details and press “Ok” to save them, or “Cancel” to quit those chages without saving. How to use Escrow (or PGP or S/MIME) instead of TLS for this message? Once encryption is enabled, click on the gear icon and choose “Escrow Instead of TLS Only” to toggle if use of “TLS Only” for email encryption will be enabled for this message. This option is not present if TLS Only is generally off for you based on your user or account security settings. This entry was posted on Wednesday, July 9th, 2014 at 1:51 pm	and is filed under New Feature Announcements. You can skip to the end and leave a response. Pinging is currently not allowed.